Former Sen. Daniel Akaka, who died on Friday at the age of 93, is being eulogized by his friends and colleagues, including former President Barack Obama, who served with Akaka in the Senate. Akaka retired in 2012 after serving a total of 36 years in Congress. 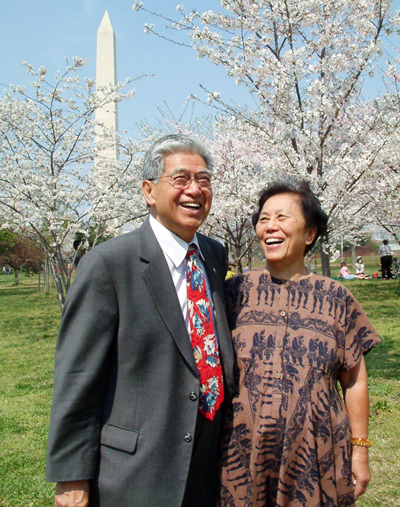 Former Sen. Daniel Akaka and his wife Millie enjoying the cherry blossoms in Washington, D.C.
Rep. Judy Chu (D-Pasadena), chair of the Congressional Asian Pacific American Caucus: “I am deeply saddened by the passing of my former colleague, Senator Daniel K. Akaka. As the first Native Hawaiian elected to the U.S. Senate and a founding member of the Congressional Asian Pacific American Caucus, he was a tremendous leader for both the people of Hawaii and the broader Asian American, Native Hawaiian and Pacific Islander community. “Throughout his 36 years in Congress, he fought tirelessly to secure funding and parity for the Native Hawaiian people and successfully passed an apology resolution to acknowledge the U.S. government’s role in the illegal overthrow of the Kingdom of Hawaii. “As a World War II veteran, he also cared deeply about our nation’s military service members and veterans. During his tenure as chairman of the Senate Veterans Affairs Committee, he led notable efforts to secure benefits for Filipino veterans who served alongside American forces during World War II as well as Vietnam War veterans exposed to Agent Orange. Japanese American Veterans Association: “Throughout his legislative career, U.S. Senator Daniel K. Akaka worked tirelessly to recognize the contributions made by Japanese Americans veterans by inserting in the Congressional Record the Nisei contributions to their nation; by enacting legislation which resulted in the review and upgrade of medals, by getting the U.S. Army to write a book on the Military Intelligence Service, and by facilitating the correction of records of thousands of Asia Pacific American veterans. Stacey Hayashi, screenwriter, “Go For Broke: An Origin Story”: “We lost a great man today. I’m having trouble finding the right words … but, I’ll forever treasure the memories of the past few years especially…. among them, getting this guy front and center when PM [Shinzo] Abe and Pres Obama visited Pearl Harbor, helping the fishermen, and this day, getting him in Go For Broke movie…. which was such a joy to me.